If one is willing to go through all the exercises (preferably in all keys) shown in Part 1, the student can get a very modern sound over the blues progression. Part 2 digs even deeper, the concepts presented are not only fun, great sounding, but also highly suited for the guitar as an instrument. Tom Lippincott once again proves he is an absolute master of the instrument and jazz guitar education. He’s doing some incredible work, and I’m always looking forward learning from him. Tom’s classes are extremely well put together! The course materials are clear and thorough. I highly recommend any of his courses!!! I believe that this (along with Pt. I) is a really well structured lesson on modern blues approaches. It certainly covers all the basics any jazz player needs to know to play the jazz blues form with modern sounds. Part one provides the student with all the foundations needed to play consistently the jazz blues style. Also, this section shows succinctly the development of the jazz blues form from a historical as well as a theoretical point of view. In part II I found some really useful ‘quartal concepts’ applied to the jazz blues form. Both parts are definitely very enjoyable and easy to follow, as well as very informative. In my opinion Tom Lippincott is not only a great musician, but also an outstanding teacher. 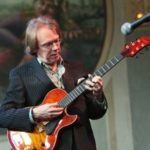 a great method to learn the "blues" in a modern and jazzy fashion that has its roots in all other great lessons tom lippincott offers here on mikesmasterclass. reflecting contemporary methods by players like kurt rosenwinkel, jonathan kreisberg or lage lund on top of his own personal spirit or teaching experience, tom offers a fresh but structural way to improve our jazz guitar playing (in an affordable way) in all his lessons here… but guys, no shortcuts, but a real way to advance, thanx a lot! Tom’s classes have really continued to inspire me and open my ear’s to so much possibility. this class is very thorough and the content is broken down in a way that makes approaching the modern sound very approachable. thank you Tom for another great class! Blues part 1 and 2 are both comprehensive and exciting. Great material without a doubt. All examples are explained well and provided in pdf. I appreciate him for sharing this. Another outstanding video set from Tom Lippincott. I bought parts 1 and 2. I highly recommend them both! If you’re looking for that elusive ‘modern’ sound, you’ll love these videos. The information is presented in a very accessible manner. Easy to understand and apply. I also bought parts 1 thru 4 of his Modern Jazz Guitar series, which are all fantastic. Tom is an incredible guitarist and teacher. The most ‘bang for the buck’ you’ll find in guitar education. It is another truly amazing class. It is clear now to me that there is a completely logical progression upwards through Tom’s series of modern jazz classes, and that this one, though most people think of the blues as a "simple" form, actually builds on the material from before; 4-part 4ths, Melody, Harmony, Rhythm; all come together here. I go back to the previous lessons and they all make so much more sense to me in looking back at what was built before. If you don’t pick-and-choose, but follow the whole sequence of his classes, I think you will be astonished at how much it opens your mind.